Photoorganizer. The easiest tool to organize your digital photos. Photo organizer is a windows only program which you can use to manipulate metadata in jpg files, and organize the location of your jpg photos on your system. And you can create slideshows which are based upon the metadata in your photos. Such slideshows can then be shown with Photo viewer, which is a windows viewer only. Photo viewer can never write to any photo, so it is impossible to change anything in your collection of photos with that viewer, so it is fully fool-proof. This viewer is included in the download and is freeware for non-commercial use. It can also be used totally independant of Photo organizer, so feel free to copy it to, for instance, an usb stick with your photos which you want to give to someone as a present. The full explanation of Photo viewer can be found here. This is a screenshot of the main window of the program. Clicking on any part of this screenshot brings you directly to the explanation of that part of the program. But if you see the program for the first time, it opens with it's settings screen. This is explained here. The window title tels you the name and location of the photo you are working with, when this photo was taken, how many photos there are in the folder you are working in and, in alphabetical order on photoname, which place the current photo has in that folder. The current photo you are working with. Comment and / or caption. This editfield is for the comment or the caption of the photo. Which one you use here depends upon the setting in the user settings dialogbox. The other one is placed in the other fields section. Caption and comment are used for more or less the same purpose. Here you can swap the content of both fields to make your own system more consistent. Delete the content of the comment or caption field, whichever is now active here. If this field was used before, that last content is kept in an undo buffer. With this button you can reuse that info. The last different 75 items which are used for the comment or caption on the main screen are kept in a list. Here you can choose one of them to be reused for the current photo. Here you can choose an item from a manually created list or you can create items in that list to be used for other photos. If you click on this button, you can choose another folder with photos to continue with. If you click on this button, you can choose another photo to continue with. Go to next or previous photo and/or write to photo. With clicking on a button with only an arrow on it you go directly to the next or the previous photo. With clicking on a button with the text write + and an arrow on it, you first write all the fields as on the screen to the current photo and then you go to the next or previous photo. With clicking on the button with only the text write on it you write the fields as on the screen in the current photo without jumping to another photo. Jump directly to the photo of your choice. With writing a number in the editbox, you jump directly to that specific photo. You can also jump by clicking on the slide bar. There are 20 fields for keywords available. Each field has (1) a notification character, (2) a checkbox, (3) an undo button, (4) a numbered choose button and (5) the keyword itself. To the right of the keywords there can be a row of notification characters. (In this example ¤). These have the same meaning as the ones described here for each single keyword, but they are referring to all the keywords at once. • : The keyword you see on the screen is the same as the keyword which was read in the photo. If you write now to the photo, this field is left unchanged. ¤ : What you see on the screen is different from the keyword which was read in the photo. If you write now to the photo, this field is changed. : If this field is empty, there is no keyword on the screen and there was no keyword read in the photo. If you write now to the photo, this field will remain empty. (2). If the checkbox is checked, the content of the keyword field is kept for the next photo, if that field is empty when you read that next photo. Keyword fields which are read from the photo are always shown in the lower numbered keyword fields. So if you want to keep a certain keyword for the next photo with the checkbox, use the higher numbers for it because then the chance that it will be overwritten by the existing keywords in the next photo is much less. (3). With the little undo button you can toggle between the current choice, the previous choice or you can grey out the field. When the field is grey, you can still see what the content was, but it will not be written to the photo. This makes it very easy to temporarily disable a keyword and reselect it again later. (4). With the numbered button you jump to the lists from which you can choose a keyword. (5). The keyword itself. This field will always be filled with the keyword which is read in the photo if there is any. If there was no keyword on this position in the photo, this field will be made empty when you change the photo or, when the accompanying checkbox is checked, the content as was already in this field will be preserved. Choosing items from a list can save you a lot of typing and prevent errors. It is also easy to see which words you have used before, to keep the whole system more consistent. There are 28 different keyword lists available. Each of those lists can be reached by clicking on it's named button. 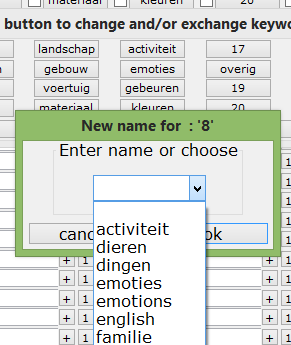 In this screenshot the list planten is chosen, which is shown by the checked checkbox at it's left side. The filled checkbox at the left of the familie list indicates that that list is now the default list. (That means that you jump to that list if you click on any of the 20 numbered keyword buttons on the main screen). You can choose any list to be the default list by clicking on it's checkbox. By clicking on a filled checkbox you remove the indication for it being the default list. If there is no default list defined, you always jump directly to the last used list. If you are typing in any of the editboxes then you can choose the content of that editbox as your new keyword by clicking on the little button at it's left or by typing tab --> enter. By clicking on the button 0 you go to the beginning of the list. By clicking on any of the other alpabetically ordered buttons, you go to the part of the list which starts with that letter. With the yellow arrows you can jump forwards and backwards in the list, one page at the time or directly to the beginning or end. In between those arrows is a number which indicates where you are in the list. Typing in the editfield of search / add creates a new entry in the list if it does not yet exist in the list. Just above and below that field 2 existing entries in the list are shown, which are the words which are alphabetically just before and just after the new entry. Clicking on one of the three buttons, marked with 1 just left of these keywords chooses that entry and brings you directly back to the main screen. And by clicking on the buttons, marked with + adds that keyword to your photo, but you stay in the keywords section to choose more keywords. All keywords you use are added to the current list if it does not yet exist in that list and it is also added to the last list with the name all. This last list all contains all keywords from all the other keyword lists and tells you in which list that keyword is written. In the keyword list all you can search for a word, just like in the other keyword lists. And to the right of each of the 2 words which are alphabetically closest to the search word above and below the word you are searching for you see a button. With that button you can jump to the keyword list which contains that word, but you can also choose that word directly, just as in the other keyword lists. You can choose the word you have just typed in the editbox, but that word will not be saved in the list. In the keyword list you can directly create new keywords by typing in the editboxes. By clicking on the button with a 1 on it, you choose the keyword in the editbox just to the right of that button. By clicking on a button with a + sign on it, you choose the keyword in the editbox and you can immediately choose more keywords to add. In that case, you see a new little window on top of the photo in which all chosen keywords are shown. The keyword list all is a bit special. It will contain all items from all the other lists. You cannot add an item directly in this list. But with the buttons + and 1 you can choose an item of the list or you can jump to one of the other lists by clicking on the named buttons at the left of the specified keyword. The edit list names button lets you edit and/or re-order the names of the lists. The names of the 27 editable lists are shown on buttons again. The name of the list all cannot be changed. Clicking on any of the 27 buttons brings you to a dropdown box in which you can type a new name or in which you can choose an existing list. If you choose the name of one of the other used lists here, you get the choice to add the contents of the list you are about to replace to that newly chosen list (The list you are replacing will then be empty) or you can simply swap the places of those two lists. Other fields using a list. These lists also has 5 items each, just like the keyword lists (Click here for that explanation). But now you have only one list for each item and the entries in the lists can be a bit longer. Only the last one folder is a bit different. This entry can be much longer and in the folder list you have an extra column with buttons new subfolder. Clicking on any of these buttons let's you add a new subfolder to the relative folder path by copying that folder path to the editbox at the top of the window. There you can edit the name and choose to use it with the button at it's left. There are 2 of these buttons. The one just below the keywords acts only on the keywords. The other one acts upon the 9 other fields above that button and the checkboxes of IPTC time, urgency, priority and showtime. If any of the checkboxes controlled by this button on the main screen is checked, clicking on this button unchecks them all. If none of the checkboxes is checked, clicking on this button checks them all. This button also appears twice on your screen. One just below the keywords which acts only on the keywords and one just below the 9 other fields which acts only on those 9 fields. This button deletes all the fields on the main screen which uses listst and the text on the button will change to Reset fields. Clicking again activates the fields again. If there was undo information for a field, that information is used. If not, the last information for that field is placed back. A digital camera usually writes the date and time when the photo was taken in the EXIF metadata. Here you can see which IPTC time is read in the photo (In this example it is 2014:02:02 17:38:39.) If there is no IPTC date in the photo this field is left empty. The EXIF time which is read in the photo is always shown in the titlebar of the main window. With the three radio buttons, you can choose to use that EXIF date and time as IPTC date and time or you choose the existing IPTC date and time or you can choose to use the date you type in yourself in the editbox. So, if you don't want to use the iptc date and time, choose box and keep the editbox empty. If you type in the date and/or time, you can use a dot . instead of the :. The first space after a . or : will be interpreted as the beginning of the time after the date. You can also omit the . or : entirely and only type in the numbers and the space. Photo organizer wil then add the separators itself. With the little button you can erase the content of the editfield or go back to the previous content of the editbox. With the checkbox you can keep the content of the editbox when you go to the next photo. This only works if you have also chosen the radiobutton box. In all other cases the editbox will always be filled with what is read in the photo. The content of the editbox will be written to the IPTC field of the photo when you write to the photo. The urgency of the photo is a number from 1 to 10 which can be directly chosen by clicking on a radiobutton. The urgency which is read in the photo is shown as a line beneath the radiobutton. With the use as read checkbox you can choose to use the urgency as already written in the photo. If you choose this option, the other checkbox, just left of the button del, is greyed out as a token that that option is not currently available. If you check the checkbox just left of the del button, the chosen value for urgency is kept when you switch to another photo. If none of the two checkboxes is checked, the urgency is not used when you switch to another photo. However, clicking on any of the radiobuttons overrides the choice which was made with these checkboxes for the current photo, so it is easy to change the urgency for an individual photo. By clicking on the del button, you delete the current choice. None of the radiobuttons will then be selected and no urgency will be written in the photo. The notification character (in this example ¤) works the same as in the fields which use a list. So, in this example 3 is chosen as the urgency and it is different from the urgency which was read in the photo, which is 9. Priority and showtime can each be a number between 1 and 255. Both of them are specifically meant for Photoviewer. Choosing a number works the same as with the other fields which uses lists or you can enter any number between 1 and 255 directly in the editbox. Priority is a number which indicates how important this photo is. The higher the number, the more important the photo. Showtime is a relative number which indicates how long this photo is shown during a slideshow. 255 is very long, 1 is very short. 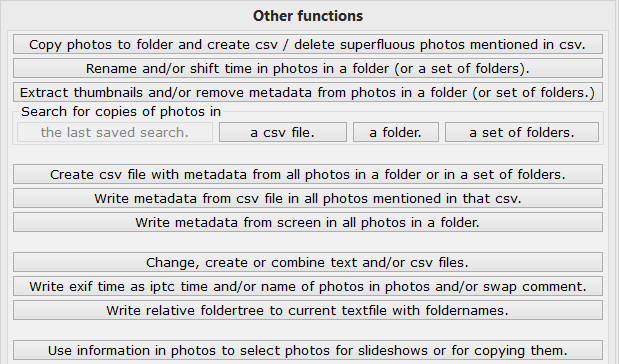 You can instruct Photoviewer to show all photos which contain the keyword building and have a priority higher than 189. In Photo viewer you can instruct that if such a photo has a showtime of 1, it has to be shown 2 seconds (or any other time you choose), if it has a showtime of 255, it has to be shown for 90 seconds (or any other time you choose). Showtimes between these extremes will be shown a calculated time between these extremes. Hide or show other fields. Standard IPTC fields which are not shown in the main screen can be shown by clicking on the show other fields button. That will change the text on that button to hide other fields. When you show those other fields, the window is made bigger to include those fields at the bottom of it. At the left of this button is the notification character which workes the same as with the keywords and the other fields using a list fields, but now for all other fields combined. This functions independently of whether those fields itself are shown or not. In this example the • indicates that there is information in these other fields and that it will not be changed it you write to the photo now. By checking the discard other fields checkbox you delete all read information for the other fields in the photo when you write to the photo. If there was information in any of the fields, this will be indicated by ¤ as the notification character, (as shown in this example) to indicate that what you will write to the photo is different from what you have read from the photo. Every photo has a filename. Here you have the possibility to preserve that name (without the extension) in the photo itself. And in the case that the filename of the photo is changed afterwards, you can then see here what the original name was. With the radiobuttons you choose what to use: photo the full filename (first radiobutton) or short filename (second radiobutton) as name , iptc for the name which is read in the photo or box for whatever you type in the editbox. With the button < you can delete the content of the editbox. Above the editbox you see the name which is read in the photo (In this example it is airplane). The text in the editbox will be the name which shall be written in the photo. (In this example the full filename (always without the extension) D:\foto's\vakanties\2005 China\08451). The ¤ notification character, as always, tells you that what will be written to the photo is different from what is read in the photo. The checkbox below the text Use is grey in this example. It is only usable when you have selected the radiobutton box. 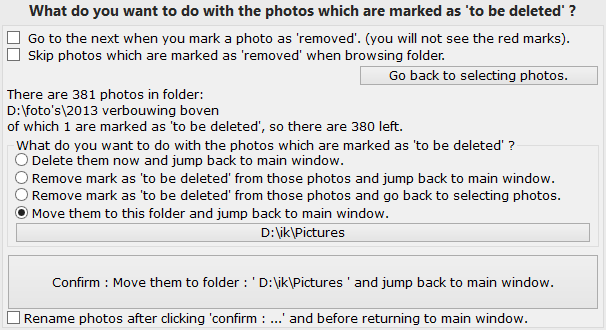 In that case, the content of the editbox will be kept when you switch to another photo if this checkbox is checked. Working directly with original photos or make copies. The biggest button on the screen. The text on the button tells you whether you are working directly in the original photos or whether you are creating copies of the photos. The first choice. All changes you make will be directly written in the original photo you are working with. Choosing this option will create a copy of the photo in the same directory as the original photo and add the text in the editbox in the filename of the photo. All the textfields will be written in this copy of your original photo. This option will create copies of the photo in the folder you specify here by clicking on the button. All text fields will be written in this copy of the photo who will get the same filename as your original photo. This option will create a copy of the photo, starting from the folder you specify here, in the folder you specify in the folder field. Example: If you specify D:\foto's as the starting folder and you specify vacations\2006 France in the folder field a copy will be created in the folder D:\foto's\vacations\2006 France. If that folder does not yet exist it will be created. The filename of the photo will be the same as from the original photo. If you create a copy and the name for that copy already exists, you can overwrite that existing photo or you can add a serial number in the name of your newly made copy by choosing the appropriate radiobutton here. After you have made a copy you can choose to delete the original photo automatically by clicking this checkbox. With the button Use these settings you return to the mainscreen. The big button will then reflect your choices you have made. Open current image in your favourite photo editing program. While you are browsing through a folder, you may want to change something in the current photo which is not possible with photo organizer, like changing the colours or adjust the contrast. This is made possible by 'connecting' these 2 buttons each to another program of your choice. In this example, the top button will open the current photo in photo viewer. The other button is not yet connected to another program. By clicking on it, you open a dialogbox in which you can choose a program with which you want to open the current photo by clicking on this button. You can always choose another program to connect to with these buttons in the user settings dialogbox. With the three buttons with blue arrows, you can rotate the current photo accordingly. With the other lightblue button you can crop the photo. This will replace the original photo. Cropping can be done in three different ways. Free crop (the leftmost radiobutton) which lets you choose any rectangular shape in the photo. Fixed size cropping. This wil crop a piece from the photo with the size as defined in the editboxes. ratio cropping. This will let you crop the photo in the ratio as defined in the editboxes. Cropping a free size or ratio cropping is done by choosing a corner for the cropped area, a left click, choosing the opposite corner and again a leftclick. Cropping a fixed size is done by placing the rectangle in the correct position and a leftclick. If you rightclick, the cropping function is abandoned. Withj the undo button you totally undo all rotating and cropping you might have done with the current photo. Note: If you want to crop the photo but want to make new, smaller, photos without overwriting the original photo you can do that while you are browsing through a folder with the Remove/rotate/crop photos in folder function. A whole list of functions can be reached directly by clicking on this button. The other functions dialogbox is only a redirection to the actual functions. The text on the buttons is descriptive. By clicking on any of the buttons on this dialogbox you go to the full description of that function. With this button you can choose any csv file which is previously created by Photo organizer and show all the mentioned photos in it as a slideshow with Photo viewer. Here you can choose any folder with photos and show all the photos in it as a slideshow with Photo viewer. With this button you close the other functions dialogbox. Remove, rotate and or crop photos in a folder. Here you can browse through a whole folder with photos and select the ones you want to delete or move to another folder. During that process you can also rotate the photo's or crop them. And when you have made those choices, you can rename all the remaining photos if you want to. Before you are renaming the photos it is also possible to manipulate the EXIF time (= the time the photo was originally taken) in the photos to correct the chronological sequence of the photos. 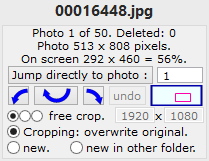 This dialogbox appears when you click on the Remove/rotate/crop photos in folder. button. At first you have to select the folder in which you want to work. By clicking the button Browse through the chosen folder with these settings. you start to go through the folder of your choice. Then you can use the keyboard as is explained here. If you check the show keyboard shortcuts in next window. checkbox, a dialogbox with all available keyboard shortcuts will also be opened after you press the Browse through the chosen folder with these settings. button. The general idea here is that you click through the directory with the mouse or arrowed buttons. With the magnifier glass you can see a part of the photo enlarged. When you go to the next or previous picture, the same relative piece of that photo is enlarged. That makes it very easy to compare 2 subsequent photos on a specific detail. With the delete button you mark the photo you see on your screen as to be deleted. This is shown as the red rectangle around the zoombox or the red cross if you don't use the zoombox. On the edge of the rectangle you see a number, the magnification. 1 x means that you see the magnified piece of the picture in real pixelsize. 4 x means that each pixel in the original image now is 4 x 4 pixels in the zoombox. While you are browsing through a folder with photos, you see this little dialogbox. It tells you the name of the current photo, how many photos there are in that folder and how many of them are marked as to be deleted. You see also it's size in pixels and it's size as it is shown on the screen. With the three buttons with arrows, you can rotate the current photo losless. With the other blue button, you can crop the current photo. Cropping can be done in three styles. Free cropping, fixed size cropping, or cropping according the the given proportion. Rotating is always done directly with the original photo. For cropping you can choose what to do. Overwrite the original photo, make a new photo in the same folder as the original or create a new photo in the folder as was chosen in the startscreen which you saw just before you started to select photos in a folder. If you overwrite the photo, the result is directly shown on your full window. If you chose not to overwrite the original, the result is shown as a little photo in a green with white dots rectangle. With the undo button you can undo all changes you might have made in the original photo. After pressing End, Enter or Esc or after you clicked the cross in the upper right corner of your window while you were browsing through a folder, you get this dialogbox, but only when there are photos marked as to be deleted, oherwise you directly return to the main window. Here you can choose what to do with the photos which were marked as to be deleted by making a choice with the 4 radiobuttons. Your choice will also be displayed on the large Confirm : ...... button. By pressing on that button, the chosen action is directly excuted. However, You can also change the settings with the checkboxes and return to the folder for selecting photos with the button Go back to selecting photos.. If this checkbox is not checked, you go back to the main window. 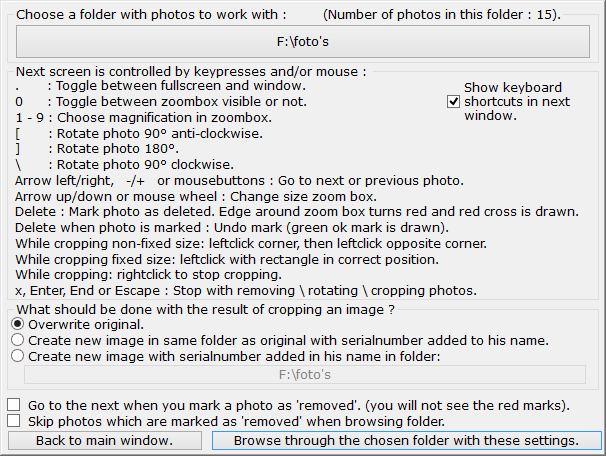 If it is checked, (or if you have chosen the Rename photos, write data and/or shift time in photos in folder. button in the Other functions. you will go to the window as described on this page. Save or load set of data. 1. Save the fields as you see on your screen as a predefined set of fields. Just fill in a name and press the appropriate Ok button or pres Tab --> Enter. 2. Load a predefined set of fields by choosing it from the drop-down box and confirm your choice by clicking the appropriate Ok button or by pressing Tab --> Enter. This will write the set on the screen so you can use it again for your photos. 3. It is also possible to delete a predefined set of fields, also by choosing it from the drop-down box and choosing the appropriate Ok button. When you start the program for the very first time, it can't find his own initialisationfile (Which is the file in which Photo organizer writes all his settings before it stops, so it knows where to continue next time.) Therefore the program shows you this window, on top of the user settings dialogbox, just as a little reminder of what is logical to do at that moment. The user settings dialogbox is the window which will automatically be opened when you use the program for the first time. There you can choose several basic settings. When you first use the program it can't find it's initialisationfile, so it knows you have not used it before. It then shows this user settings window. In this window you can set several basic instructions. You only have to do this once, although you can always return to this window via the user settings button on the main screen. This program can't check for itself whether it is the latest version or not. However, the version number is on this screen (here it is 1.000) and the latest version number is mentioned on the first page of www.photoorganizer.nl. You can check that very easily by clicking on the www.photoorganizer.nl button. In the upper right corner of the window you see these 5 buttons which link you directly to the relevant pages on the website. First the main promotional website, where all newsflashes will be placed and where you can check whether you are still working with the latest version of the program. The second button leads to the complete explanation of Photo organizer. Then a button which links to the frequently asked questions on the web. The next button brings you to a form which makes direct contact with the programmer very easy. And the last button points to the instructions on the web how you can get a key for the full version of the program. This editbox is ment for the key to unlock the full potential of the program. But the only limitation of the trial version is the number of photos and folders it can handle per folder. So you should be able to see whether it is worthwile for you to spend 15 euro on the full program by using the trial version first. The program does need a location to store the lists with keywords and other lists. It chooses a location for you, in this case F:\ because the program was run from an USB stick which used F as it's drive letter. But if you run the program from your harddrive in your computer, it will choose the my documents folder as the default. You can choose whatever writable folder you want to use by clicking on this button or you can simply accept the suggested default location. If you connect a removable storage, like an USB stick, to your computer, photoorganizer will show this button in the user settings window. By clicking on it you get the option to choose a folder in which you want to copy the program and all of it's associated lists and settings. This is all you have to do to be able to use the program on another computer. simply by connecting your stick to that other computer. It is also very easy to keep the settings and lists files synchronized between your USB stick and your computer. Simply choose the other functions button on the main screen and the Change, create or combine text and/or csv files. button in the window you see then. There choose the option Synchronize 2 textfiles folders. and choose the 2 folders you want to synchronize. The information which this program can manipulate in your photo is read and/or written in the comment and the IPTC table. Usually there is only one comment and/or one IPTC table in your photo or they simply do not (yet) exist. But some programs write new information in new tables in the photo, so there can be more than one comment or IPTC table in your photo. In the case that there are more than 1 comments and/or IPTC tables in the photo (very unusual, but possible), Photo organizer will combine the contents of the same fields it finds in those tables and add the text as defined in this editbox in between. Comment and caption are both textfields in which you can write a description of the photo. Here you can choose which of the two is used on the mainscreen. The other one will be used in the other fields section. Here you can choose with which program to open the current photo if you click on the open photo with ... buttons on the main screen. 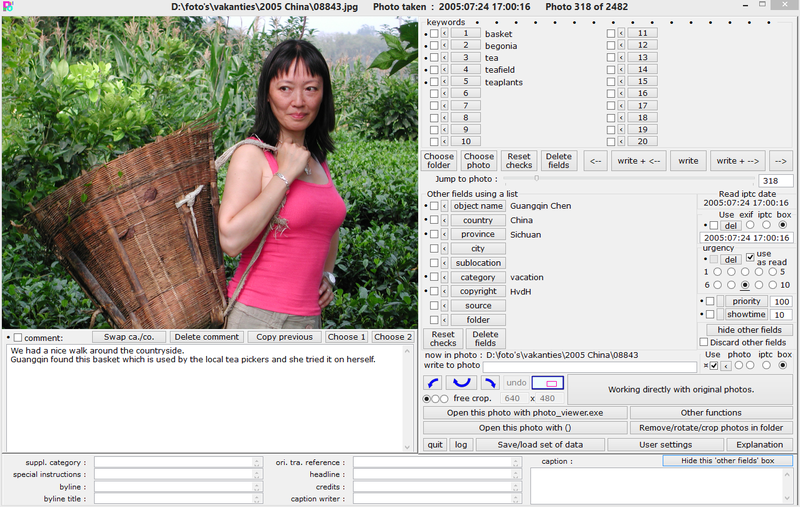 In this example, the first button is linked to the default program photo viewer and the second button is linked to irfanview, which is also a great program to work with while showing or working with photos. See www.irfanview.com for more details about that program. All warnings and errors which are found while you are working with photo organizer are written in a log file. Here you can define the name of that logfile. The logfile will be in the folder you have defined as the folder in which to store the textfiles. With the buttons you can open the logfile or delete the logfile. Here you can choose which language will be used by Photo organizer. 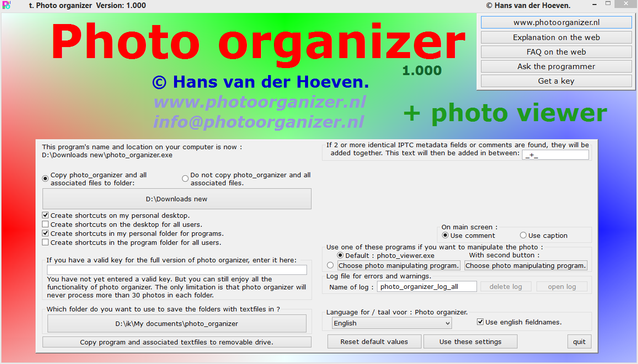 Both English and Nederlands (=Dutch) are available in Photo organizer. English is the default language. But Photo organizer will see all textfiles in the language folder and give you the choice here to use such a textfile as the language for Photo organizer. By checking the use english fieldnames checkbox you keep using the English names for your textfiles and as fieldnames on the screen, regardless of which language you use in Photo organizer. With this button you go back to the default settings in this window. Here you choose to save and use the settings as you see them in your window and to go back to the main window. Clicking here brings you back to the main window without saving any of the settings. Clicking here stops the program without saving any of the settings. Some basic characteristics and functions of the program are explained in the program itself and can be reached with this button. The window which will then appaear also contains the link to the explanation on the web you are reading now. Quit the program. All settings are saved in an initialisationfile, so next time the program shall continue as if it was never interrupted. If there are errors found while you are working with photo organizer, those errors are showed on the screen or written in a log textfile. With this button you can open that logfile with your favourite text editor. If this button is grey (like in this example) it means that no new line has been written in the logfile during your current session with photo organizer. The other fields. These 9 fields are part of the IPTC standard, but are generally not of much use for organizing a personal collection of photos. But you can use them as you like. These fields are all directly editable. If you never use these fields you can kept them hidden with the hide other fields button as explained here.